A Thousand Thoughts :: TicketServices.gr " // + "
Only electronic bookings are available. The system presents you automatically with the best available seats. Please download in a PDF form and print your Entry Passes for your convenience. Your booking is valid provided you check in at least 45 minutes (19:45) before the performance starts. Please make sure that you arrive on time, otherwise your seats will be allocated to other visitors. The setup consists of the director narrating and cueing photos and moving images from the stage while the Kronos Quartet plays a live score. It has all the elements of a film, but it happens live. The story itself will be about the Kronos Quartet and its long career, and the members of the group will play songs from their repertoire as well as talk from time to time. At the same time, archival footage and sound bites from longtime collaborators will be shown, like Philip Glass, Steve Reich, Terry Riley, and many others. The Kronos Quartet has played an important role in the music industry through the hundreds of original scores they have written, their love of the musical traditions around the world and eventually the way they introduced a string quartet in pop culture. They appeared in TV shows like Sesame Street, adapted the music of artists like Jimmy Hendrix, covered songs like Misirlou and collaborated with a wide range of artists from avant garde Laurie Anderson to the minimalist Philip Glass. 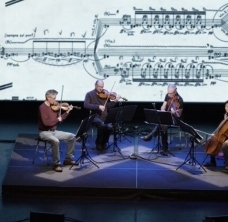 At A Thousand Thoughts we connect to the power of Kronos Quartet's music through an experimental kinesthetic experience that marries the power of sound with the magic of cinema and the power of physical presence in space.